One of the fun things Amy has started doing with Custom Fit is to have a collection called Basics. These are sweater patterns built into the Custom Fit site for really classic designs. This design is Reservoir: An Open Cardigan. It was started back in…March? Yep March. Just a couple weeks after the Basics collection went live. But then I lost my knitting mojo and took a break of sorts. But now with Fall coming soon-ish I am so happy to have something soft and warm ready to go. I love this sweater. I love it so very much. Nice enough to wear to the office, but casual enough to fit into my home life too. It is knit with Wollmeise Merino DK in the color way Sabrina. WMDK as it is called is a 6 ply yarn that I would say is a pretty standard DK weight and is less prone to pilling than most other yarns I’ve used. It also comes in nice big skeins of 200g or 468 yards! Gotta long a sweater that takes less than 3 skeins and I’m so happy to own another two sweater quantities of this base. To jazz it up a bit I took the lace design from Georgie Hallam’s kid sweater design Ferris Wheel. There is also an adult version called Summer Festival too. I have dreams of knitting Lu the kid version as a school sweater. We’ll see when I get to it. Sometimes my plan is faster than my abilities. But for now I am just so happy to have cast off something! And such a lovely something too. 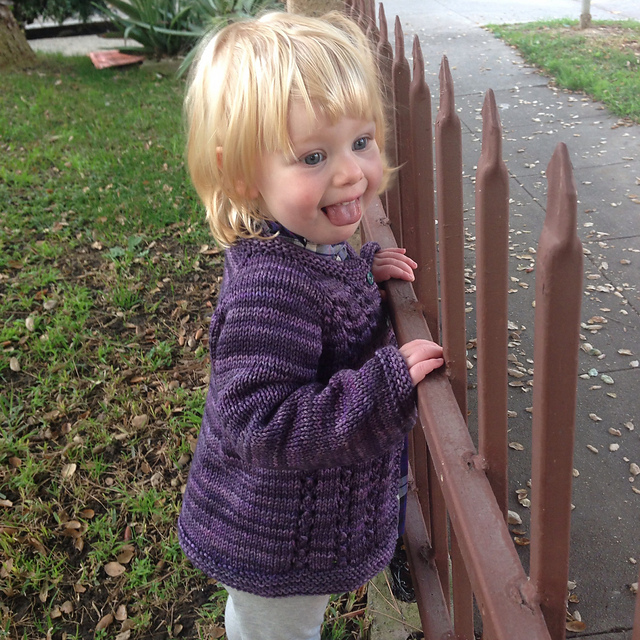 Have questions about sweater knitting with Custom Fit? I am always happy to answer! Editing to add – I just realized the post title makes no sense! Replacement? What do you mean? 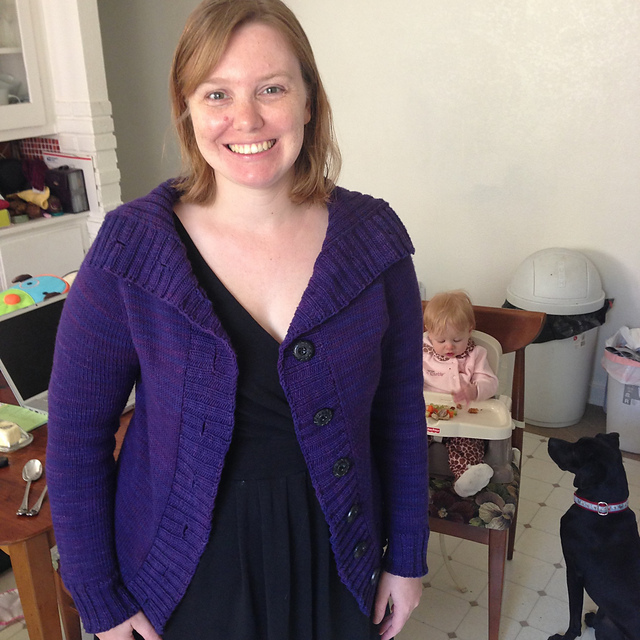 Well back before Custom Fit I made a Calligraphy Cardigan by Hannah Fettig in WMDK and it is one of my most worn sweaters. But the fit is horrible. So Reservoir is mean to be a replacement for Calligraphy as my ‘can throw over anything’ sweater. Now here is a bonus photo from early 2013 with bonus not-quite-1-yet Lu and our dog Dottie waiting to snag a tasty morsel.